Nigeria's ruling All Progressives Congress (APC) party on Tuesday dismissed several challenges to President Muhammadu Buhari after a new opposition alliance formed to try to prevent him from being re-elected to a second term next year. More than 30 parties, including the main opposition Peoples Democratic Party (PDP), on Monday announced they were teaming up against Buhari for next February's vote. 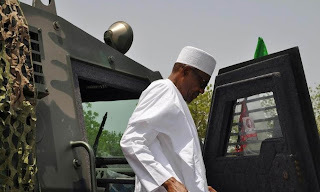 That followed the creation last week of a splinter group within the APC of disaffected members who criticized Buhari's three years in power as "a monumental disaster". But APC spokesman Bolaji Abdullahi said both developments would have no effect. "We are confident that no level of gang-up can make our government under President Buhari waiver in its promises to Nigerians to rid our country of corruption and improve the quality of lives for our people," he said in a statement. Buhari in 2015 became the first opposition candidate to defeat a sitting president in Nigeria's history, triggering a wave of optimism to end insecurity and endemic corruption. But his promise to defeat Boko Haram insurgents has not yet been fulfilled, despite repeated assertions to the contrary, and security challenges have emerged elsewhere in the country. They include a resurgence of violence in a long-running battle for land and resources between cattle herders and farmers that has killed some 1,000 people since the start of the year. Nigeria's economy is recovering from its first recession in 25 years while there is a logjam of anti-corruption cases in the courts and claims he is targeting political opponents. At the same time, there are question marks about whether the 75-year-old former military ruler is fit enough for a second four-year term of office.